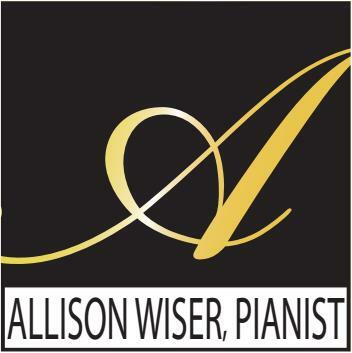 Welcome to allisonwiserpianist.com, your special events planning destination to a more classy and charming celebration. There are a number of special events that I can cater to. My style is elegant and purely musical, delighting the listener with graceful technique. The presence of live piano music is the essence of class at any wedding, business party, or other sophisticated celebration. The atmosphere created by a skilled pianist at your special event is sure to keep your guests talking about it for days to come. I have been accumulating pieces over the years that are perfect for creating the delicate atmosphere you are looking for, like the timeless classical music of Debussy and Beethoven. I also enjoy modern tunes, that you will surely recognize, that have a more upbeat, fun feel to them, like "You've Got a Friend in Me" from Disney's "Toy Story". Take a look at my ever-growing repertoire to find what you are looking for. Do you have suggestions for me? I am always up to learning something new. My wish is to make you happy, so suggest whatever you want. I will gladly add your suggestions to my library of music. Not to mention, it's only helping me expand my musical knowledge. Fill out the contact form that's available for you in order to accommodate your requests and inquiries. I will be sure to get back to you promptly. could not experience in other ways. I never wanted to quit, nor will I ever. Read my biography to learn more about me and my musical history.